In partnership with the U.S. Forest Service, TWI will play a major role in restoring healthy prairie and wetlands across the 2,000-acre outwash plain, which stretches across much of the southwestern corner of Midewin. With old Army ammunition bunkers visible in the background, a reminder of Midewin’s history of landscape alteration, Coca-Cola Americas President Steve Cahillane announced the new water replenishment partnership on September 13. Photo by Vera Leopold/TWI. The grant is part of a larger partnership among Coca-Cola, the U.S. Department of Agriculture, and NFF to restore watersheds on National Forest lands. 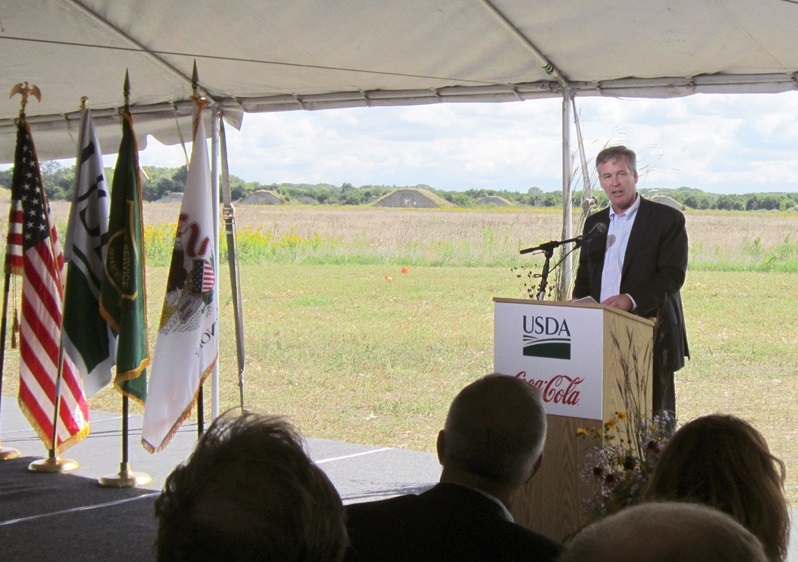 Coca-Cola Americas President Steve Cahillane formally announced the partnership at an event at Midewin on September 13 that also featured U.S. Agriculture Secretary Tom Vilsack, U.S. Forest Service Chief Tom Tidwell, and National Forest Foundation President Bill Possiel. At Midewin, the Coca-Cola funds are primarily supporting the removal of drain tiles on the outwash plain. These buried clay pipes artificially drained the landscape during its many years of use for agriculture and as the country’s largest Army arsenal. Gary Sullivan, TWI senior ecologist, worked with an earth-moving contractor to conduct a demonstration of drain tile removal at the September 13 event. Disabling the drain tiles is one of the critical first steps in restoring the natural water patterns needed for high-quality wetland and prairie plant communities to return. This and other heavy equipment work will be followed by intensive efforts to control invasive plants and reestablish many native species of wetland and prairie plants through seeding and planting. The National Forest Foundation, a nonprofit partner of the Forest Service created by Congress, will continue to leverage funds for the outwash plain’s restoration over the coming years. Midewin is one of 14 national forests and grasslands targeted for restoration under NFF’s Treasured Landscapes campaign. As part of this campaign, NFF’s goal is to raise $2.5 million for the South Prairie Creek Outwash Plain project, which will also include removing dozens of old concrete Army ammunition bunkers and old roads still in place on the parcel. NFF has identified the Wetlands Initiative as the primary on-the-ground partner to complete the habitat restoration portion of the work. Once its transformation back to a functioning natural area is complete, the South Prairie Creek Outwash Plain will connect with an even larger landscape of restored and high-quality sites on Midewin’s west side, including all six of TWI’s previous restoration projects there.